Sept. 15, 2014– Legacy Recordings today announced that iconic singer-songwriter and 2014 Rock and Roll Hall of Fame inductee Yusuf / Cat Stevens has joined the label’s storied musical family. To kick off this exciting new chapter in Yusuf’s career, Legacy Recordings will release his first new studio album in five years, entitled Tell ‘Em I’m Gone, on October 27. Recorded across the globe, including Los Angeles, Dubai, Brussels, and London, the album features 10 brand-new studio recordings, including five original tracks and five carefully-chosen cover songs. Tell ’Em I’m Gone features musical contributions from Richard Thompson, blues harmonica legend Charlie Musselwhite, singer-songwriter Bonnie ‘Prince’ Billy, Tuareg group Tinariwen, and guitarist Matt Sweeney. The album was produced by Yusuf and Rick Rubin and was mixed by Yusuf and Paul Samwell-Smith. This new relationship with Legacy Recordings will include brand new recording projects, existing catalog titles, previously unreleased live material, and a treasure trove of audio and video from Yusuf/Cat Steven’s personal archives. The new album, Tell ‘Em I’m Gone is the first piece of a larger relationship that will continue over the coming years. Tickets for the general public begin going on sale on Saturday, September 27th at 10:00am local time (please check your market for select timings). Fans who pre-order Tell ‘Em I’m Gone on Amazon.com (starting now until Sunday, September 21 at 11:59pm PST) will receive early access to purchase tickets to the US tour dates. Please see specific details below. The North American tour comes on the heels of the European leg of the Peace Train…Late Again tour. For complete ticket on sale information visit www.YusufCatStevens.com. 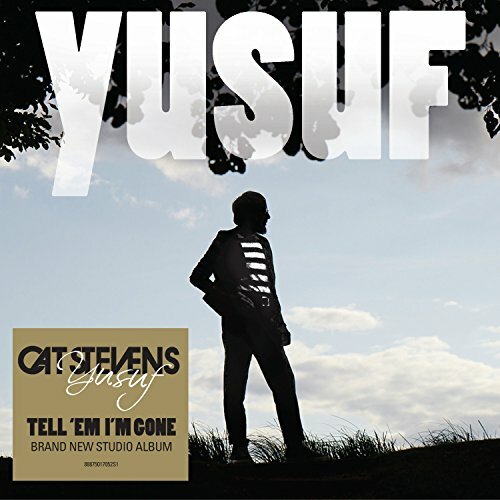 On Tell ‘Em I’m Gone, Yusuf returns to the roots of his teenage musical inspiration: American blues and R&B, using these genres to explore humanity’s climb to freedom with songs that recall the spirit of his earliest days as a nascent singer-songwriter in London. Each track on the album revives the age-old themes of freedom and peace that have marked more than four decades of Yusuf’s musical career. Stunning originals like “I Was Raised In Babylon” and “Cat And The Dog Trap” plus covers of blues-pop and American song standards (“Big Boss Man,” “You Are My Sunshine”) and a moving version of Edgar Winter’s “Dying To Live,” find Yusuf as strong of voice and as engaging a performer as ever. Tell ‘Em I’m Gone is available now for pre-order at physical and digital music retailers. Having first found fame as a teenage heartthrob singer in 1960s England, Cat Stevens gained worldwide acclaim for his intimate and affecting works in the 1970s. His compositions “Wild World,” “Peace Train,” “Father and Son” and “Morning Has Broken” remain staples of the folk genre. Following a conversion to the Islamic faith in 1977, Stevens retired from the music business to work with and support causes in education and humanitarian relief. In 2006 Yusuf returned to pop music with the album An Other Cup. Yusuf was also inducted into the Rock and Roll Hall of Fame in March 2014. Legacy Recordings, the catalog division of Sony Music Entertainment, is home to the world’s foremost library of historically significant commercial recordings, a peerless collection of works by the most important musical artists of the 19th, 20th and 21st centuries. Across a variety of platforms, the label offers contemporary music fans access to thousands of meticulously restored and remastered archival titles representing virtually every musical genre including popular, rock, jazz, blues, R&B, folk, country, gospel, Broadway musicals, movie soundtracks, rap/hip-hop, world music, classical, comedy and more. Founded in 1990 by CBS Records (rebranded Sony Music in 1991), Legacy has expanded on its original mission (preserving and reissuing back catalogs of Columbia Records, Epic Records and associated CBS labels) to provide new and innovative avenues for artist and repertoire exposure including Grammy winning curated retrospectives, social media campaigns, Oscar winning soundtracks, new talent signings and groundbreaking campaigns for established artists and catalog. Following the creation of Sony BMG Music Entertainment in 2005, Legacy assumed responsibility for recordings from the archives of the BMG family of labels (including RCA Records, Arista, J Records, Jive, Profile, Silvertone, Sony BMG Nashville and Windham Hill, as well as imprints including Bang!, CTI, Mainstream, Monument, Ode, and others).